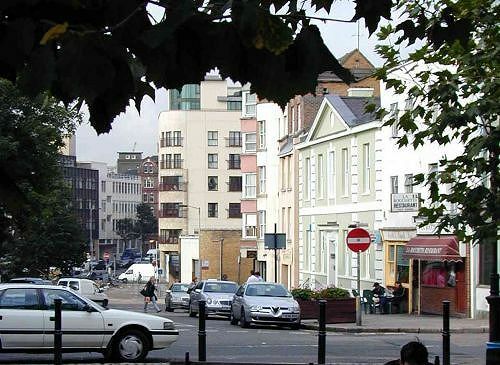 Between January 1999 and December 2007 I worked at an office in Clerkenwell Green, a medieval suburb of the City rapidly becoming fashionable once more. 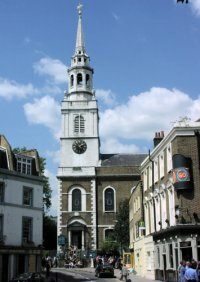 Clerkenwell takes its name from the 12th century Clerks' Well off Farringdon Road, where the clerks performed miracle plays. St John's Gate off Clerkenwell Green was known to Shakespeare as the place where his plays were licensed. 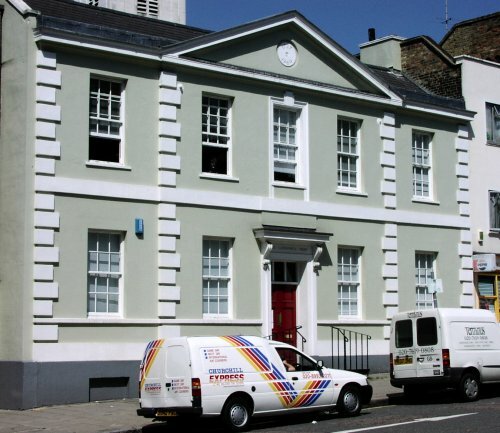 My office moved to a site near St Katherine's Dock in December 2007. I retired Just before then so only visited it occasionally while I was working part-time. I'll keep the Clerkenwell pages for a while as it's a fascinating corner of London. 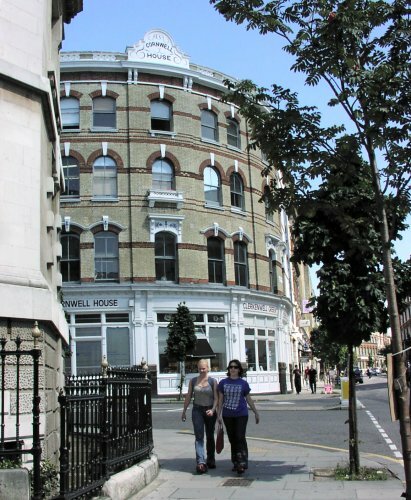 "The road that passes through the Clerkenwell area was built in 1878, although its name is much older. It derives from a spring where parish clerks would assemble once a year to read from the bible. 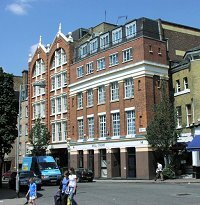 The Clerk's Well still exists - it has been incorporated into offices in Farringdon Road. 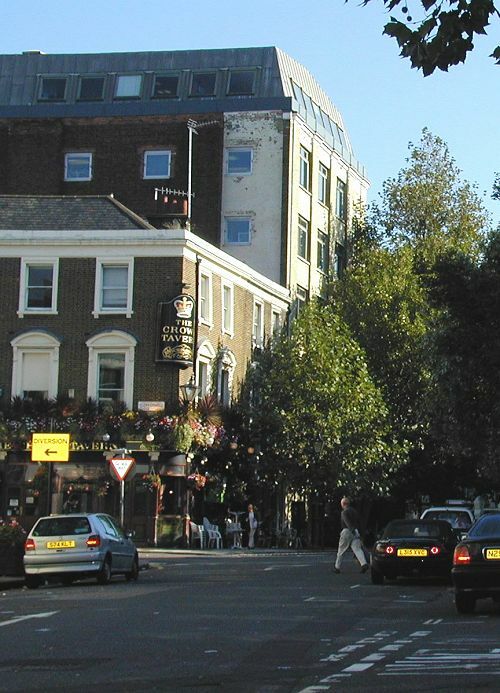 "Clerkenwell grew up as a hamlet serving monasteries established in the 12th century. LAter its position and water supply made it a natural overspill for the City. After the Great Fire of 1666 it became home to clock and watch makers, jewellers and gin distillers, making use of the good water supply. 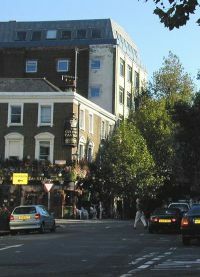 "In the 1800s it had become an overcrowded slum and a centre of radicalisn leading to the Clerkenwell Riot. It took almost 140 years before the decline was reversed and it is again a spillover for City businesses." 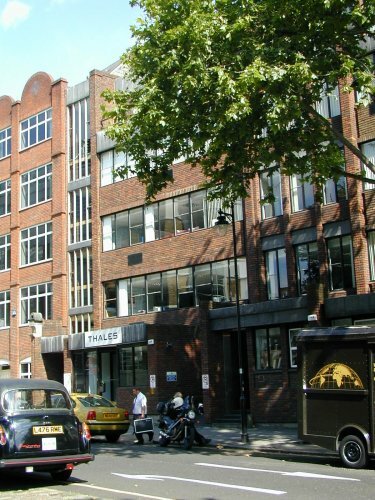 Number 2, where I used to work is a rather dull-looking brick building, dating from about the 1960's. It had been quite pleasantly refurbished prior to our occupying the building and new furniture was fitted in the Autumn of 1999. The view looking down the Green from the central island. Clerkenwell Road is visible heading off towards Holborn. St James Church on the North side of the Green dates from 1792. The original organ was built by George Pike England, an ancestor of the Mander family, in 1792. It was enlarged by Gray and Davison in 1877. In 1929, the instrument was extensively altered by Noteman, who moved the case forward and built what was effectively a new organ inside it. A popular watering hole just across the road from our office. The younger members of staff tended to congregate here on a Friday afternoon after work. 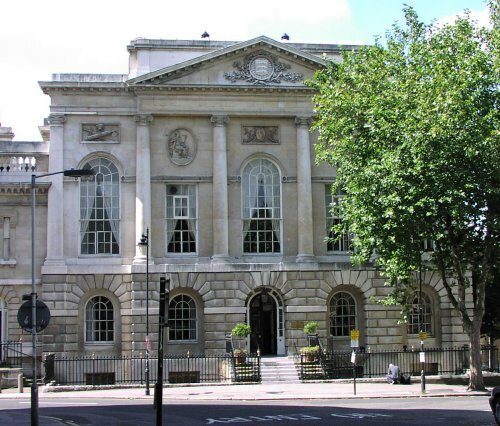 This imposing building, on the West side of the Green, is the former Sessions House, dating from the early 18th Century. It is now the London Masonic Centre. The Middlesex coat of arms is still visible on the portico. 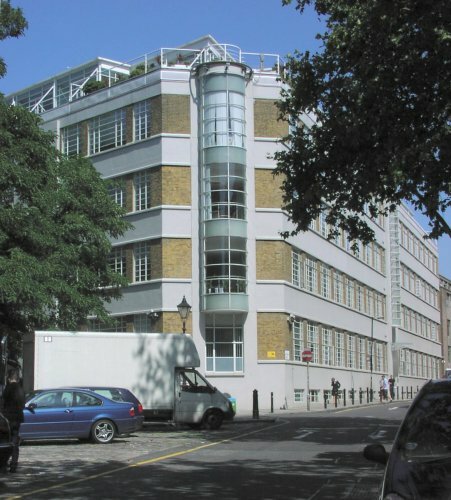 This building on the corner of Aylesbury Street and Clerkenwell Green is a classic of 1930s architecture. The semi-circular section facing looks as if it ought to be a staircase, but isn't. Well Court is actually outside the Green at 14-16 Farrindgon Lane. The building houses the re-discovered Clerk's Well with a small exhibition about its history. 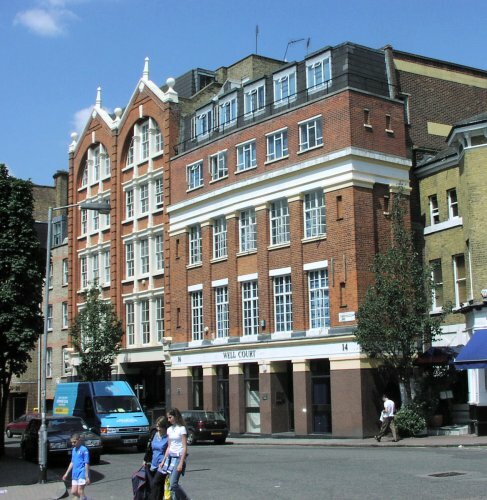 It is presently occupied by a firm of chartered accountants. 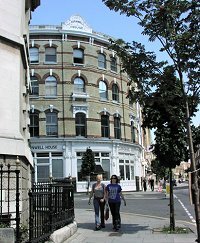 On the corner of the Green and Clerkenwell Road is this semi-circular building. 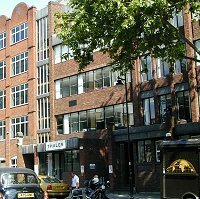 It is leased by the Craft Central, (formerly the Clerkenwell Green Association), in order "to maintain and promote fine craft and design skills in the heart of London's historic community of Clerkenwell". It is home to a number of small jewelry and other craft workshops. 37 Clerkenwell Green. 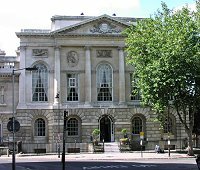 Since 1933 the Marx Memorial Library has been housed in the building whose history encapsulates the richness of the Clerkenwell tradition of radicalism. Read more on their web site. 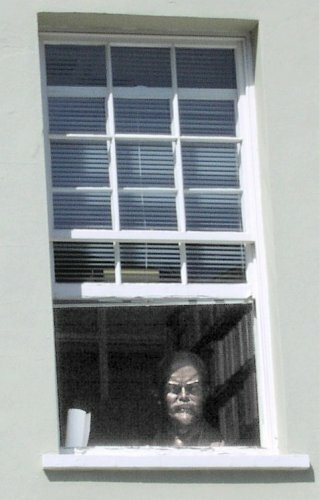 On a hot Summer lunchtime I spotted Comrade Lenin keeping an eye on the workers outside in the green.